Servicing Visalia and all surrounding areas! Call us today at (559) 635-8448 for a free estimate! If termites, ants or other pests are causing you problems, call us at (559) 635-8448 today or contact us to keep them away forever. For over 23 years Pro-Tech Pest Control has been providing a variety of quality pest control services to the Visalia area. Managed by a veteran team of professionals, our goal will and has always been customer satisfaction! Protect your home and business from pests which can transmit diseases to you and your loved ones. Our industry leading pest control solutions provide a thorough pest management process to eliminate the insect issues you have now and most importantly, can prevent future infestations from happening. Don’t allow pests to control the quality of life in your home, routine maintenance is key for keeping bugs at bay! From property damage to severe health issues, pests are more than just off putting to look at, they can be dangerous too! With Vislia Pest Control, you can finally relax knowing your home and loved ones are safe. We are a local, family owned company that’s large enough to handle any treatment problem and small enough to give every customer the attention they deserve. Give us a call today at (559) 635-8448. 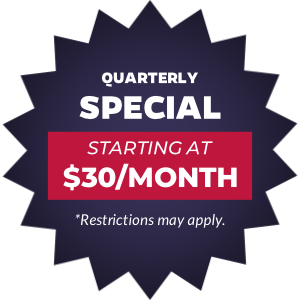 Starting at $30 per month we’ll make your home bug-free! With schedules that fit with every family.